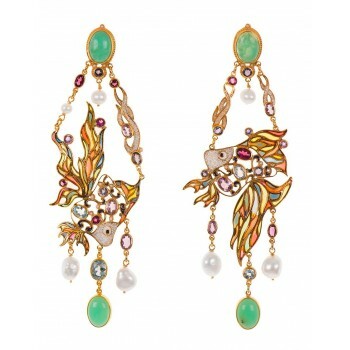 Earrings with chrysoprase, amethyst, rhodolite pearl and micromosaic of seed pearls. Made with enamel in cloisonné technique, with chrysoprase, amethyst, rhodolite pearl and micromosaic of seed pearls. StoneChrysoprase, amethyst, rhodolite, pearl and micromosaic of seed pearls.